COLLEGE STATION, Texas (AP) — Highly touted true freshman quarterback Kyler Murray looked at ease in his first start as Texas A&M’s quarterback with big runs and sharp decisions throwing the ball. Murray won’t win the Heisman Trophy like Johnny Manziel did as a freshman three years ago, but the Aggies’ newest dual threat has already given them a huge lift. Murray ran for 156 yards and threw for 223 more in his starting debut Saturday as Texas A&M ended a two-game slide with a 35-28 win over South Carolina. "Poise," receiver Ricky Seals-Jones said when asked what he saw from the freshman. "The first couple of series, he said he was kind of nervous. But then after he said that, he got stable and he let it rip and let it go and made plays." Coach Kevin Sumlin said Murray was comfortable and allowed the Aggies (6-2, 3-2 SEC) to speed up their offensive tempo. "The biggest thing that I thought he did was not force the game, and not force things and let the game come to him," Sumlin said. "He guessed a little bit early on some of the quarterback read stuff. Once he settled down and actually started to read things out, he was effective." Tra Carson added 122 yards rushing and a touchdown and Donovan Wilson had a 60-yard interception return for a momentum-changing score for the Aggies less than 2 minutes after Murray’s go-ahead 1-yard run on a fourth down. Brandon Wilds ran for 128 yards and two scores for the Gamecocks (3-5, 1-5) in their second game under interim coach Shawn Elliott since the retirement of Steve Spurrier. They won Elliott’s debut 19-10 over Vanderbilt two weeks ago before an open date. "We just didn’t get the job done, nonetheless we saw improvements in our football team," Elliott said. "A loss is a loss, and we understand that, and we’re very, very disappointed in what we didn’t accomplish. But they need to understand we improved as a group, as a team, as a staff. It’s a process." Sumlin re-opened the competition for the A&M’s starting quarterback job this week, and Murray was announced as the starter Friday. Murray completed 20 of 28 passes with a touchdown, and ran 20 times with the go-ahead score — and did something Manziel didn’t do very often, sliding at the end of runs to avoid more hits. "I guess Kyler learned from Johnny not sliding and decided to make sure you get down and protect himself and continue doing that so you can have him for the next play," Carson said. 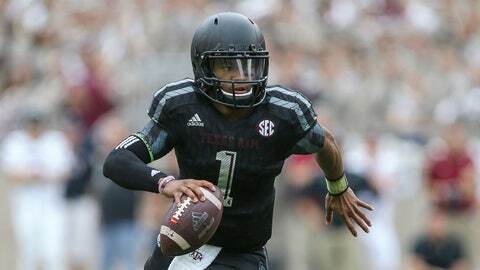 Sumlin figures Murray, also a standout baseball player, slid about 10 times. And that is what the coach wants to see. Murray wasn’t available to reporters because Sumlin doesn’t allow freshmen to do interviews. Kyle Allen threw 13 touchdowns with two interceptions as Texas A&M started 5-0. But the sophomore had three interceptions returned for touchdowns by Alabama in a 41-23 home loss, and was 1-of-16 passing in the second half (the only completion lost yards) of a 23-3 loss at Ole Miss last week. Murray led Allen High to three consecutive Texas state championships and went undefeated as a starter in the Dallas-area school. The game was tied three times before Texas A&M went ahead 28-21 on Allen’s 1-yard keeper on fourth down, when he faked a handoff to Carson and then swept left and scored untouched on the Aggies’ opening drive after halftime. "He fooled a lot of people and walked in," Sumlin said. Less than 2 minutes later, Wilson’s pick-six put the Aggies up 35-21. On the second play of the game, Murray gained 14 yards on a quarterback draw play. He had another 14-yard run and a 13-yard pass as the Aggies got to the 2 before Taylor Bertolet was wide right on a 25-yard field goal attempt. Murray threw a 10-yard touchdown pass to Josh Reynolds on the second drive, when he completed all four of his passes for 55 yards and had a 5-yard run. There was an announced crowd of 102,154 at Kyle Field, but there were a lot of empty seats. Heavy rains and flooding in Texas over the previous 24 hours made travel difficult, if not impossible, for many fans, especially those from the Houston area. The game was played under cloudy skies, but there was no rain.